Already the owner of two successful stores in the Kansas City area, Kathy Gates wanted a very different design direction for her third store so she called 3 Dots Design. Here are a few thoughts from Kathy on what it was like to work with 3 Dots Design. 3 Dots Design was great to work with! They really take the time to figure out the right look and feel for the owner, the company culture and the business. This is my third location and it's very clearly the most thought through and professional looking location. We wanted to bring in elements from Kansas City and the running community and they had many great ideas to bring my vision to life. How is the new store different from your other two stores? I learned a lot from opening my second location. The biggest lesson is that it's easier and cheaper to not learn lessons the hard way. I hired 3 Dots Design because I wanted direction figuring out the best way to structure the store for the best use of the space, the most economical way to build it out, how to have customers flow through the space, etc. Having experts that can tell you tips and tricks to getting the most out of your space saves time and money in the long run. this week. Check it out! 3 Dots Design is a strategic retail design and visual merchandising company that aligns brands with consumer needs to create exciting and enticing retail environments. With over 50 years combined experience in the specialty run, cycling, outdoor and active apparel industries, the 3 Dots Design team consults on strategic retail design and merchandising with retailers and manufacturers in those arenas. They have also worked with clients in the yoga, coffee, college bookstores, cannabis, womens fashion channels among others. Before starting 3 Dots Design, Holly Wiese had been well acquainted with run specialty retail by working at the iconic Playmakers running store in Michigan, her native state. After starting 3 Dots Design in 2009, she consulted in the bicycle industry where she oversaw all aspects of retail design and visual merchandising for Giant Bicycle, the world’s largest bike manufacturer. In 2005, Holly met Andy Davis while working with Giant Bicycle and he has been the lead designer for the company since its inception. With 2 other full time employees; Ryan Wiese and Adam Batliner, and many contractors “on call” around the country, the 3 Dots Design team can easily expand or contract its workforce as needed for various projects and retail rollouts. They find most of their projects to be located out of state, throughout the country however, they always love working local when they can. 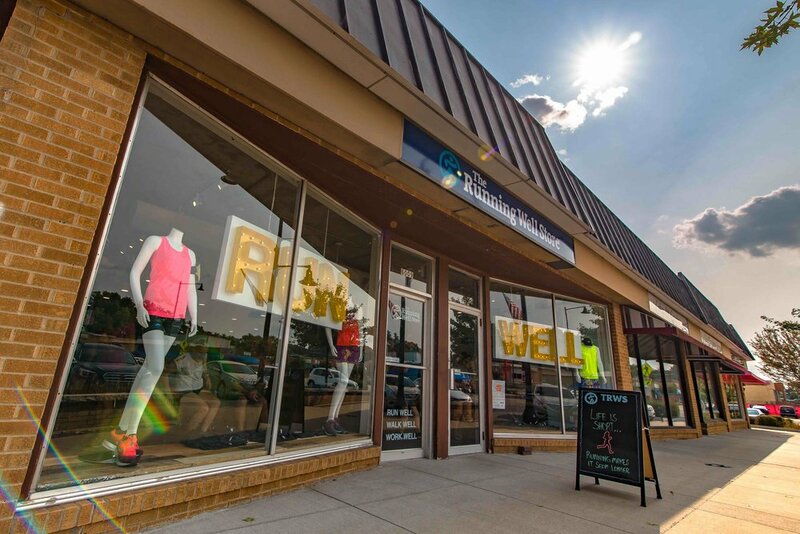 A few of their local store design projects include the iconic Neptune Mountaineering remodel, Boulder Cyclesport South, Smartwool Cherry Creek and Ramble on the West end of Pearl Street in downtown Boulder. They’ve also designed 2 of the Denver area Runners Roost stores and worked on the Go Far Smartwool partnership store on East Pearl, also in Boulder. In addition to designing retail environments and product fixtures, they also spend a good amount of time travelling the country speaking at stores and trade show events. They recently returned from training retailers on how to improve their visual merchandising and how to sell more apparel at a bicycle retailer event in Minneapolis called Frostbike. 3 Dots Design also hosts an annual or semi-annual training workshop for all retailers called Rocky Mountain Retail Camp (www.rockymountainretailcamp.com). This event always proves to be very exciting for visiting retailers and it’s loaded with lots of training sessions and hands on merchandising practice at local stores. If you have a moment to swing by Neptune Mountaineering, be sure to grab a coffee in their new café and take in their new digs. 3 Dots Design was proud to work with the new shop owners to bring their vision to life as well as to design their new logo, graphics, signage, fixtures and store layout. Several months ago, we shared some exciting photos of the remodel project we were involved in at Neptune Mountaineering in Boulder, CO. Many of you emailed us questions and comments about this project so we thought we would share some more information on the store history and their remodel project. 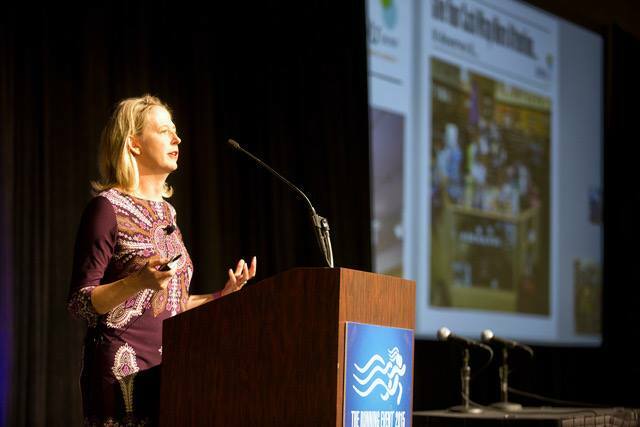 The Outdoor Retailer Magazine published the following article that really dives in to the whole story and sheds some light on the transformation. If you’re in Boulder, CO, we recommend you swing by to see how we worked with this iconic retailer to re-invent itself and breathe new life in to the retail space. By integrating a new logo, inspiring graphics, modern fixtures, a coffee shop and a whole new vibe, Neptune is now once again, a thriving destination retailer for mountaineers as well as casual outdoor enthusiasts or simply the passerby looking for a good cup of Joe! 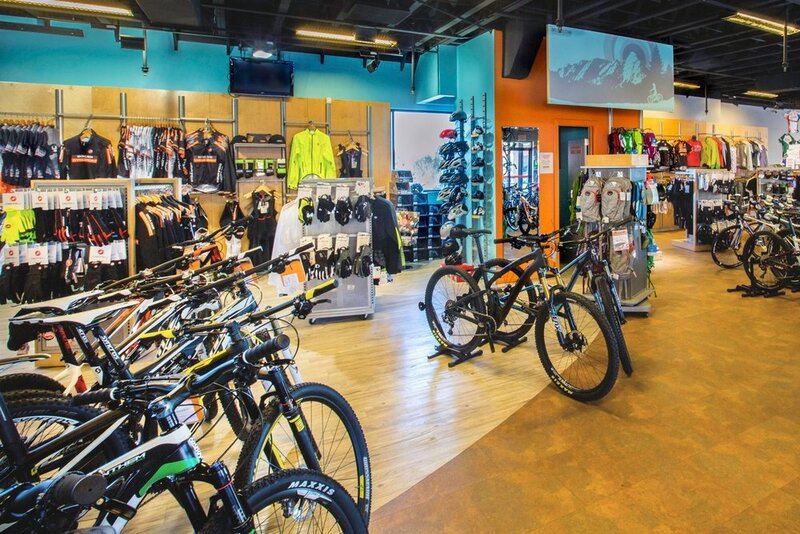 When it comes to remodeling, bike shops around the world are pushing the envelope and bringing great design ideas to retail shop design. If you want your bike shop to look cutting edge and updated, here are 3 major bike shop retail design trends. Mix of natural with the industrial. When it comes to shop remodeling trends, stores are mixing natural woods with clean lines from concrete floors and brick walls with metal fixtures. With bikes standing out against warm wood tones while blending with industrial metal accents, sellers are able to present the dual nature of bikes as mechanical yet connected to the outdoors. Handsome Cyclesis a good example of this blend of natural colors with an industrial twist. Feature bikes on walls. In addition to the necessary racks of bike inventory, the trend is to pull unique bikes out and feature them in a highlighted display on the wall. This is a great way to break up a group of bike racks and also a good way to engage your customer with a clearer presentation of the features on the highlighted bike. The Factory Five Boutiqueexercises this trend in a great way, showcasing the fixed gear frames for visitors on their walls and hanging from the ceilings. Not only does it draw color to the walls, but visitors can get a good look at every part of the frame without moving the bike. And given its position on the wall, the frame looks as light as it is, making riders more susceptible to seeing the advantage of the frame. Bright and bold colors for visibility. As more and more people want bikes for commuting, bike shops are displaying their wares with a mix of bright and bold accents that bring bikes and accessories to the forefront. Displaying bright products--such as reflective materials, neon-colored clothing, and colorful helmets or handlebars--gives consumers a sense of safety, visibility, and forward-thinking when looking at bikes in shop. Playing with these bold colors can add great interest to your shop. For more design ideas and inspiration as well as versatile fixtures for displaying your product be sure to check out our website. Retail Fixture Buying Made Easy! run & outdoor speciality retailers.